Human CYP2C9 is important in the metabolism of numerous clinically used drugs such as the anticoagulant warfarin, the anticonvulsant phenytoin, antidiabetic drugs such as tolbutamide and glipizide, the hypertensive agent losartan, and numerous nonsteroidal anti-inflammatory drugs. Several studies have reported that certain drugs such as rifampicin and phenobarbital induce CYP2C9, but the molecular basis for this induction remains unknown. In the present study, we demonstrate that the human pregnane X receptor (hPXR) mediates induction of CYP2C9 by the prototype drugs rifampicin, hyperforin (found in St. John's Wart), and phenobarbital. Deletion and mutagenesis studies with luciferase reporter constructs showed that a functional PXR-responsive element located –1839/–1824 base pairs upstream from the translation start site was the primary binding site mediating the rifampicin induction of CYP2C9. This site was previously described as a constitutive androstane receptor-responsive element (CAR-RE). Mutational analysis of 3- and 12-kilobase CYP2C9 promoter fragments indicated that this proximal binding site was essential for rifampicin inducibility, although a cooperative effect could be attributed to a second CAR-RE located at –2899/–2883. In summary, we have demonstrated rifampicin induction of CYP2C9 promoter constructs that is consistent with the magnitude of induction of CYP2C9 protein and mRNA reported in vivo and in primary human hepatocytes, and we have identified the cis-element essential for this response. This is the first report to demonstrate that the nuclear receptor PXR mediates induction of CYP2C9 with rifampicin, phenobarbital, and hyperforin. CYP2C9, the principal member of four human CYP2C enzymes, is one of the most important drug metabolizing P450s in human liver. CYP2C9 is the rate-limiting enzyme in the metabolic clearance of clinically used drugs such as the hypoglycemic agents tolbutamide and glipizide, the anticonvulsant phenytoin, the S-enantiomer of the anticoagulant warfarin, and numerous nonsteroidal anti-inflammatory drugs such as flurbiprofen, diclofenac, torsemide, and ibuprofen (Goldstein and de Morais, 1994; Miners and Birkett, 1998; Goldstein, 2001; Lee et al., 2002). Approximately 16% of clinically used drugs are metabolized by CYP2C9. Individual variability occurs in the metabolism of CYP2C9 substrates in humans and a principal factor is the presence of genetic polymorphisms in humans (Sullivan-Klose et al., 1996; Goldstein, 2001). Most notably the CYP2C9*2 and -*3 alleles have significantly lower intrinsic clearances of CYP2C9 substrates both in vivo and in vitro (Lee et al., 2002). Drug induction is another source of variation in the metabolism of CYP2C9 substrates, which may result in drug toxicity or therapy failure. Studies in primary human hepatocytes have indicated that CYP2C9 mRNA, protein, and catalytic activity are induced by drugs such as rifampicin, hyperforin (the active constituent in St. John's Wort), phenobarbital, and dexamethasone (Gerbal-Chaloin et al., 2001; Rae et al., 2001; Raucy et al., 2002; Madan et al., 2003; Watkins et al., 2003). Some clinical studies have also reported that rifampicin treatment consistently enhances the clearance of drugs eliminated by CYP2C9, such as tolbutamide, phenytoin, losartan, S-warfarin, and the antidiabetic drugs glyburide and glipizide (Zilly et al., 1975; Kay et al., 1985; Heimark et al., 1987; Williamson et al., 1998; Niemi et al., 2001), suggesting that rifampicin induces CYP2C9 expression in vivo. Induction of cytochrome P450 genes generally occurs at the transcriptional level and is mediated by certain nuclear receptors including the constitutive androstane receptor (CAR) and the pregnane X receptor (PXR) (Waxman, 1999). Many nuclear receptors are ligand-dependent, including human PXR, which binds rifampicin, hyperforin, and lithocholic acid among others (Moore and Kliewer, 2000; Moore et al., 2000a,b). In contrast, the prototypical inducer phenobarbital and many other compounds known to induce CYP2B genes via CAR-dependent mechanisms do not appear to directly bind to CAR. Most drugs that induce gene expression via CAR-dependent mechanisms are thought to signal CAR translocation to the nucleus (Zelko et al., 2001; Kawana et al., 2003; Maglich et al., 2003). Both CAR and PXR then heterodimerize with the retinoid X receptor in the nucleus, bind to various responsive elements within gene promoters, and associate with coactivators/corepressors to regulate gene transcription (Honkakoski, 2003). Additional transcriptional factors such as HNF4α may also be involved in the up-regulation of certain P450s by drugs through CAR and PXR (Tirona et al., 2003). To date, three studies of the CYP2C9 promoter have been reported and four regulatory elements have been identified at –155, –1675, –1839, and –2899 bp from the translation start site. The first site is a HNF4α binding site, which was suggested to influence the hepatic expression of CYP2C9 (Ibeanu and Goldstein, 1995). A site at –1675 bp identified as a glucocorticoid-responsive element interacts with the human glucocorticoid receptor to mediate dexamethasone induction of CYP2C9 (Gerbal-Chaloin et al., 2002). Two additional sites in CYP2C9 (a distal and proximal CAR-RE) were shown to bind hCAR and the mouse CAR in vitro and transactivate CYP2C9 luciferase reporter constructs (a distal and proximal CAR-RE) (Ferguson et al., 2002; Gerbal-Chaloin et al., 2002). However, there was little evidence of human relevant drug induction of CYP2C9 promoter activity by these elements or nuclear factors in these reports. These sites bind CAR and PXR, yet rifampicin treatment produced only a minimal 60% increase in luciferase activity of a reporter construct containing four copies of the proximal CAR-RE in HepG2 cells cotransfected with hPXR. This increase was much lower than the average 4-fold mRNA induction of CYP2C9 seen in primary human hepatocytes (Raucy, 2003), and no increase was seen with reporter constructs carrying the natural context of the CYP2C9 promoter containing this element (Gerbal-Chaloin et al., 2002). Therefore, the nuclear factors and transcription factor binding sites regulating rifampicin induction of CYP2C9 require further investigation. The present study examines the mechanism of CYP2C9 induction using CYP2C9 promoter constructs in HepG2 cells cotransfected with PXR and ligands rifampicin, hyperforin, and phenobarbital. We used deletion constructs and site-directed mutagenesis to identify the elements involved in induction. The proximal CAR-RE was identified as the essential PXR-responsive element within a 12-kb CYP2C9 promoter construct to mediate PXR-dependent induction of CYP2C9 by rifampicin, hyperforin, and phenobarbital. Chemicals. DMSO, rifampicin, hyperforin, phenobarbital, and other common reagents were purchased from Sigma-Aldrich (St. Louis, MO). Phenobarbital was dissolved in cell culture medium and stored at –20°C. Rifampicin and hyperforin were dissolved in DMSO. Cell culture media were purchased from Invitrogen (Carlsbad, CA). Desalted oligonucleotides were purchased from Genosys, Inc. (The Woodlands, TX). Restriction enzymes were purchased from New England Biolabs (Beverly, MA). All other reagents were of the highest grade available. Transient Transfection Constructs. A 3-kb region of the 5′-flanking promoter of CYP2C9 from a previous study (Ferguson et al., 2002) was excised and inserted into fresh pGL3-Basic vector called CYP2C9-3k. This construct was used to produce deletion and mutational constructs. The CYP2C9-3k plasmid was double-digested with NheI and either StuI or HindIII to progressively delete the inserted promoter fragment CYP2C9-3k from the 5′ end. The adhesive ends were blunted with Klenow fragment (New England Biolabs) and self-ligated to produce two deletion constructs: CYP2C9-1.9 kb and CYP2C9-1.5 kb. A human CYP2C9 PAC clone (Incyte Systems, Palo Alto, CA) was digested with NheI and PstI to obtain an additional 11 kb of the 5′-flanking promoter region of CYP2C9 (–12096 to –988 bp). After gel purification, the recovered DNA fragment was inserted into linearized CYP2C9-3k/pGL3-Basic that had been linearized by double digestion with NheI and PstI to yield wild-type CYP2C9-12k. pSG5-hPXR was kindly provided by Steve Kliewer (GlaxoSmithKline; Uxbridge, Middlesex, UK) (Kliewer et al., 1998). (XREM)-3A4-362/+53 was obtained from Brian Goodwin (Goodwin et al., 1999). Cell Culture and Transfection. HepG2 cells were maintained in Eagle's minimal essential medium supplemented with 10% fetal bovine serum and antibiotics at 37°C under 5% CO2. Luciferase constructs and receptor constructs (or empty vectors, 100 ng of each) were combined with 10 ng of internal control pRL-TK, then mixed with Effectene transfection reagents (Qiagen, Valencia, CA), and transfected into HepG2 cells 12 to 24 h after seeding into 24-well plates (1–1.5 × 105 cells per well). Twenty-four hours later, medium was replaced, and drugs were added in the appropriate concentrations. Drugs were incubated with the cells for 24 to 36 h, followed by dual luciferase assays (Promega, Madison, WI). Firefly luciferase activities were normalized to Renilla luciferase readings to calculate promoter activity. Site-Directed Mutagenesis. The pGL3-Basic construct, including –3 kb of the CYP2C9 promoter region, was used as the template for site-directed mutagenesis (QuickChange site-directed mutagenesis; Stratagene; La Jolla, CA) to prepare CYP2C9-3k/-2899m, CYP2C9-3k/-1839m, and CYP2C9-3k/dmut. The forward primers utilized for mutagenesis are as follows (hexamer half-sites are indicated by bold capital letters and mutated nucleotides are underlined): Distal CAR-RE mutation, 5′-gtacaacacaaagaaGCTTGCctacaTAAACTatg-3′; Proximal CAR-RE-mutation, 5′-cCAAACTcttcTCTGGTctcaatctagtcaac-3′. DNA sequencing was performed for all constructs to verify the mutations and to assure that no spurious mutations occurred. To insert the mutated proximal CAR-RE in the 12-kb promoter luciferase construct, KpnI and PstI were used to excise an 11-kb 2C9 promoter fragment (from a KpnI site in the vector to –988 bp in the promoter) from the wt CYP2C9-12k construct. This fragment was subcloned into pUC19. A region of the promoter from DraIII (–2750 bp) to PstI (–988 bp) containing the proximal CAR-RE was replaced by the corresponding CYP2C9 fragment from the CYP2C9-3k/-1839m construct containing the mutated proximal CAR-RE. This strategy was used to avoid a second DraIII site in the pGL3-Basic vector. The resulting construct was double-digested with KpnI and PstI. The 11 kb of the 2C9 promoter fragment possessing the mutated CAR-RE was reinserted into KpnI and PstI linearized CYP2C9-3k, resulting in the desired CYP2C9-12k/-1839m construct. Gel Shift Assays. Human retinoid X receptor and hPXR were synthesized in vitro using the TNT Quick-Coupled in vitro transcription translation system (Promega) following the manufacturer's protocol. Klenow fragment (New England Biolabs) was employed to incorporate 32P-dCTP at the 5′ ends of the double-stranded oligonucleotides. Approximately 70,000 cpm of labeled probe was incubated with or without synthesized nuclear receptors in a 10-μl binding reaction containing 10 mM Tris-HCl, pH 7.5, 1 mM MgCl2, 0.5 mM EDTA, 0.5 mM dithiothreitol, 4% (v/v) glycerol, 50 mM NaCl, and 1 μg of nonspecific competitor poly(dI-dC) (Sigma-Aldrich). In parallel reactions, specific cold competitors or specific hRXRα antibody (Santa Cruz Biotechnology Inc., Santa Cruz, CA) were added to the mixture before the addition of proteins. After 20 min of incubation at room temperature, 7.5 μl of the reaction mixture was loaded onto a 5% nondenaturing polyacrylamide gel for electrophoresis in 0.5× Tris/borate/EDTA buffer for 2 h at 150 V. The gels were dried and exposed to film. The following are the sequences of the oligonucleotides used as probes, wild type, or mutated specific cold competitors (hexamer half-sites are indicated by bold capital letters and mutated nucleotides are underlined): CAR-RE of CYP2C9-prox-wt: 5′-ctagacCAAACTcttcTGACCTct-3′; CAR-RE of CYP2C9-prox-mut: 5′-ctagcCAAACTcttcTCTGGTctg-3′; CAR-RE of CYP2C9-distal-wt: 5′-ctagaaTGAACCctacaTAAACTat-3′; CAR-RE of CYP2C9-distalmut: 5′-gtacaacacaaagaaGGGACCctacaTAAACTatg. Statistical Analysis. Analysis of variance procedures were used to assess the significance of differences between activity of constructs and effects of cotransfection with hPXR and various drug treatments and the interaction between these factors. A variance-stabilizing logarithmic transformation was used in these analyses. Pairwise comparisons were made by Fisher's least significant difference test. Rifampicin InducesCYP2C9Promoter Transactivation. When a 3-kb CYP2C9 luciferase reporter construct was transfected into HepG2 cells, cotransfection with hPXR increased luciferase activity 3.8-fold (p < 0.0001), and treatment of cells with 10 μM rifampicin produced a further 2.3-fold increase over DMSO vehicle controls (p < 0.0001). As expected, rifampicin produced a strong activation of a CYP3A4 positive control (XREM)-3A4-362/+53 reporter construct in HepG2 cells cotransfected with hPXR (∼30-fold). 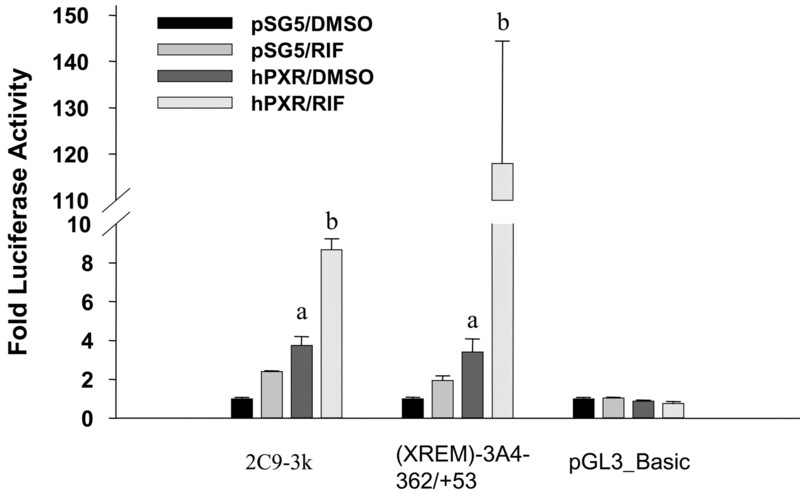 Neither PXR nor rifampicin had any effect on the activity of the empty pGL3-Basic control construct (Fig. 1). Rifampicin induces transactivation of the CYP2C9 promoter through hPXR in HepG2 cells. 100 ng of luciferase reporter constructs were combined with 2 ng of internal control pRL-TK and transiently transfected into HepG2 cells with or without cotransfected pSG5-hPXR. Twenty-four hours after transfection, cell media were refreshed, and cells were treated for 36 h with 0.1% DMSO or 10 μM rifampicin (RIF) and assayed for luciferase activity. Values represent the mean ± standard error (S.E.) of three independent transfections. a, hPXR cotransfection significantly increased luciferase activity compared to the empty pSG5 control, p < 0.0001. b, rifampicin treatment significantly increased luciferase activity over hPXR cotransfected controls, p < 0.0001. Functional Evaluation of the Putative PXR Binding Sites. Two deletion constructs of the CYP2C9 promoter were examined to initially localize the cis-element(s) that mediate the rifampicin induction (Fig. 2A). As shown in Fig. 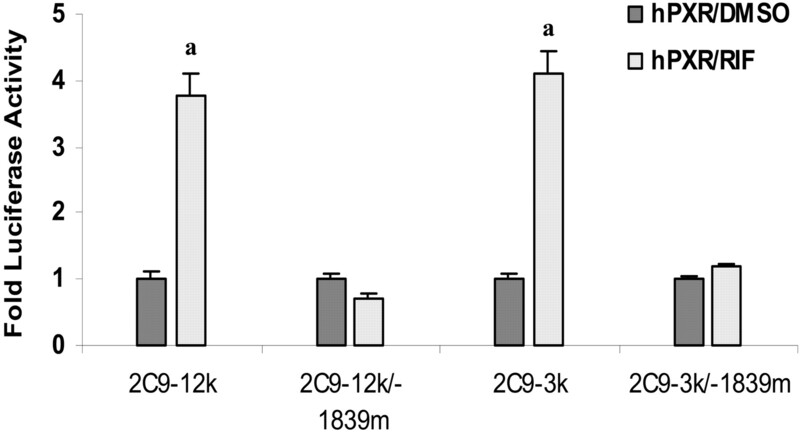 2B, rifampicin increased luciferase activity of both the CYP2C9-3k and CYP2C9-1.9k constructs when the cells were cotransfected with hPXR (p < 0.0001), although the activity of the 3-kb construct was greater than that of the 1.9-kb construct (p < 0.0001). In contrast, the CYP2C9-1.5k construct did not respond to hPXR and was not induced by rifampicin. Therefore, the rifampicin-responsive element appeared to be located between –3 and –1.5 kb of the CYP2C9 promoter region. Deletion of the CYP2C9 promoter to localize rifampicin-responsive element(s). CYP2C9 promoter constructs (A) were transfected into HepG2 cells along with pSG5-hPXR expression plasmids or empty pSG5 vector. Cells were treated for 36 h with drugs (0.1% DMSO vehicle or 10 μM rifampicin (RIF)) and assayed for luciferase activity (B). Drug responses were normalized to pSG5 empty vector without drug treatment (ND). Values represent the mean ± S.E. of three independent transfections. 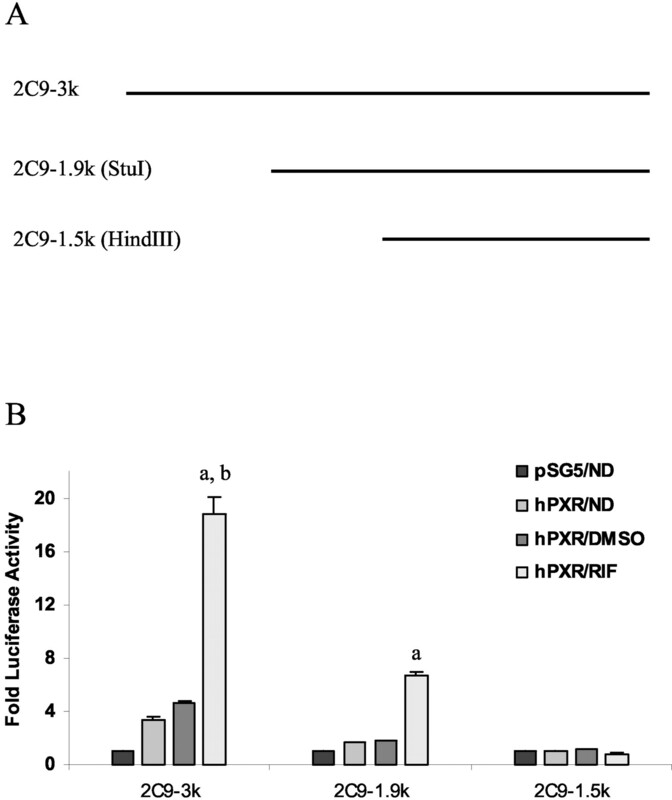 a, in cells cotransfected with hPXR, rifampicin treatment significantly increased luciferase activity of the 3- and 1.9-kb constructs over DMSO controls (p < 0.0.0001). b, rifampicin treatment increased luciferase activity to a greater extent in cells transfected with the 2C9-3k construct than cells transfected with the 2C9-1.9k construct (p < 0.0001). Within this region, two CAR-binding elements have been identified –2899 and –1839 bp from the CYP2C9 translation start site (Ferguson et al., 2002; Gerbal-Chaloin et al., 2002). To evaluate their contributions to rifampicin induction of CYP2C9-3k, these two CAR-REs were then mutated individually or in combination within the CYP2C9-3k luciferase construct (Fig. 3 A). The resulting mutant constructs were transfected into HepG2 cells followed by treatment with 10 μM rifampicin and assayed for luciferase activity. As shown in Fig. 3B, the wild-type CYP2C9-3k promoter construct showed the highest response to rifampicin in cells cotransfected with PXR, while the mutation of the distal CAR-RE decreased the response by ∼30% (p < 0.005). When the proximal CAR-RE was mutated alone or in combination with the distal element, the response to rifampicin in cells cotransfected with PXR was almost abolished. These results indicate that the proximal CAR-RE (–1839/–1824) of the CYP2C9 promoter plays an essential role in hPXR-mediated rifampicin induction, although the distal element may play a cooperative role to produce maximal induction. Identification of the hPXR-responsive elements in the CYP2C9-3k mediating rifampicin induction. A, wild-type CYP2C9-3k and mutants investigated. Bold characters indicate consensus hexamer half-sites of two CAR-REs with mutated bases underlined. X indicates the mutated CAR-RE within the CYP2C9 –3k promoter reporters. B, transfections were performed in HepG2 cells with the combination of internal control pRL-TK and wild-type CYP2C9-3k or mutants. Luciferase activity was analyzed 36 h after treatment with 10 μM rifampicin. ND, no drug treatment. Values represent the mean ± S.E. of three independent experiments. a, in cells cotransfected with hPXR, rifampicin treatment significantly increased luciferase activity of the 2C9-3k and 2C9-3k/-2899m constructs, p < 0.0001. b, the response of the 2C9-3k/-2899m construct to rifampicin was 30% lower than that of the 2C9-3k construct (p < 0.005). Mutation of the proximal element alone (the 2C9-3k/-1839m construct) or in combination with the distal element (2C9–3k/dmut) eliminated the response to rifampicin (RIF). To further examine the direct binding of these two CAR-REs to hPXR, in vitro synthesized hPXR and hRXR were mixed with labeled oligonucleotides in electrophoretic mobility shift assays. As shown in Fig. 4, both elements formed specific complexes with the hPXR/hRXR dimers, which were competed out by a 20-fold excess of unlabeled wild-type probes but not by the same amount of the mutated cold competitors. When a specific antibody against hRXR was included, supershifted complexes formed with both elements. Furthermore, the specific complex formed by the proximal element was stronger than the complex formed by the distal one. Binding of hPXR to the distal and proximal CAR-REs of CYP2C9. Identical amounts of radiolabeled double-stranded oligonucleotides containing either the distal or proximal CAR-REs of CYP2C9 were individually mixed with in vitro synthesized hRXR or hPXR alone or with combinations of hPXR/hRXR at room temperature for 20 min, followed by 5% polyacylamide gel electrophoresis separation. Twenty-fold molar excess of unlabeled cold competitors (CC) including wild-type (w) and mutant (m) probes were added in the parallel binding reactions to compete out specific complexes indicated by small arrows. Two micrograms of polyclonal antibodies (Ab) to hRXRα were used in parallel experiments to produce supershift bands indicated by the thick arrows. Drug Responses ofCYP2C9. We then investigated whether hPXR and the responsive elements identified above also mediate the induction of CYP2C9 by other drugs, such as phenobarbital and hyperforin. As shown in Fig. 5A, 0.5 mM phenobarbital produced a 2.5-fold induction of the CYP2C9-3k promoter construct when HepG2 cells were cotransfected with hPXR (p < 0.0001). This response was abolished when the proximal CAR-RE was mutated, while mutation of the distal element had a minimal effect on this induction (p < 0.05). Hypeforin (0.2 nM) induced the activity of the CYP2C9-3k construct approximately 2.5-fold (p < 0.0001, Fig. 5B). Mutation of the proximal element essentially abolished induction (no significant increase observed after hyperforin treatment, p = 0.2862, Fig. 5B), while mutation of the distal element had a much smaller effect on induction (p < 0.05). Human PXR mediates induction of CYP2C9 by phenobarbital (PB) and hyperforin. HepG2 cells were transfected with wild-type or mutant CYP2C9-3k or (XREM)-3A4-362/+53 positive control plasmid along with hPXR plasmid versus empty vector pSG5. Twenty-four hours after transfection, 0.5 mM PB (A) or 0.2 nM hyperforin (B) were added. After 36 h of incubation with drugs, cells were lysed and assayed for luciferase activity. Data were normalized to values obtained with empty vector and vehicle alone. Values represent mean ± S.E. of three independent analyses. In cells cotransfected with hPXR, drug treatment significantly increased luciferase activity over vehicle controls, a, p < 0.0001; b, p < 0.05. The CYP2C9-3k/-1839m construct did not respond to phenobarbital or hyperforin in cells cotransfected with hPXR. ND, no drug treatment. The Proximal CAR-RE Functions as an Essential PXR-Responsive Element ofCYP2C9. To determine whether any additional distal regulatory elements within the CYP2C9 promoter play a role in rifampicin induction, we compared the ability of rifampicin to activate 3- and 12-kb CYP2C9 promoter fragments in parallel transfections in HepG2 cells cotransfected with hPXR. Rifampicin induced activity of both the CYP2C9-12kb and CYP2C9-3kb fragments in cells cotransfected with hPXR (p < 0.0001) (Fig. 6). Importantly, induction of the 2C9-12kb promoter was no greater than that of the 2C9-3kb promoter. Moreover, mutation of the proximal CAR-RE within the context of the either the CYP2C9-3k and CYP2C9-12k promoter luciferase reporter constructs completely abolished rifampicin induction in cells cotransfected with hPXR. The proximal CAR-RE is the essential hPXR-mediated rifampicin-responsive element within the 12-kb CYP2C9 promoter. HepG2 cells were cotransfected with CYP2C9-3k or CYP2C9-12k luciferase reporter constructs possessing the wild-type or mutated proximal CAR-RE along with empty pSG5 expression plasmid or hPXR. Twenty-four hours following transfection, cells were treated with 10 μM rifampicin (RIF), and cells were lysed at 36 h for luciferase activity assays. Data were normalized to the vehicle treatment. Values represent mean ± S.E. of three independent analyses. a, rifampicin treatment significantly increased luciferase activity over hPXR-cotransfected controls, p < 0.0001. Clinical studies have shown that rifampicin increased the clearance of a number of CYP2C9 substrates in vivo in man (Zilly et al., 1975; Kay et al., 1985; Heimark et al., 1987; Williamson et al., 1998; Niemi et al., 2001). Moreover, rifampicin, hyperforin, and phenobarbital induce CYP2C9 protein and mRNA 2- to 5-fold in primary human hepatocytes (Gerbal-Chaloin et al., 2001; Rae et al., 2001; Raucy et al., 2002; Madan et al., 2003; Watkins et al., 2003). Previous studies identified two CAR binding sites in the human CYP2C9 promoter located –2899 and –1839 bp from the CYP2C9 translation start site (Ferguson et al., 2002; Gerbal-Chaloin et al., 2002). 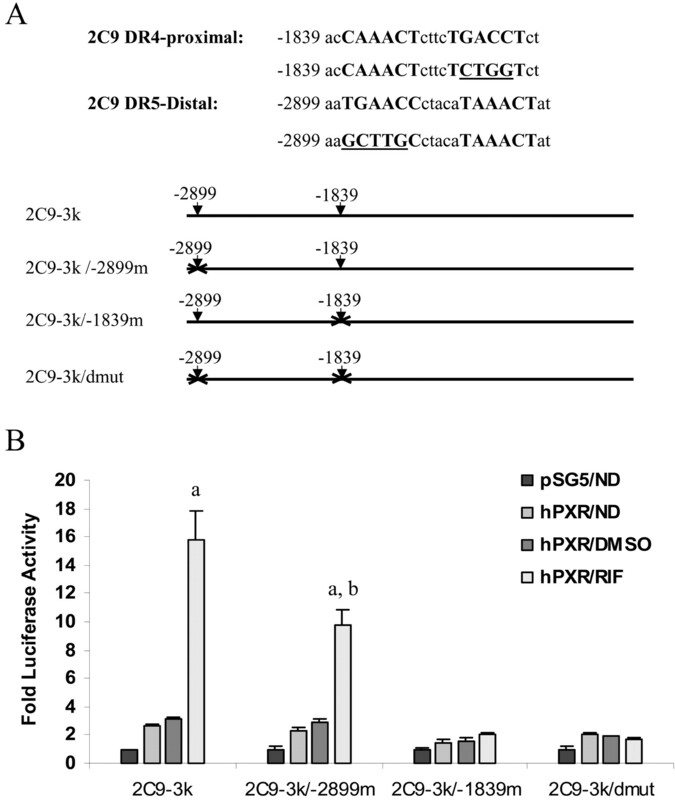 Gel-shift assays showed that these sites bound both CAR and PXR, but CYP2C9 promoter luciferase constructs were activated by hCAR to a much greater extent than hPXR. However, studies investigating the CYP2C9 inducibility via these two elements were inconclusive. Androstenol repressed mouse CAR activation of the CYP2C9 promoter, and the mouse CAR ligand TCPOBOP (1,4-bis[2-(3,5-dichloropyridyloxy)]-benzene) derepressed this activation. However, in the absence of a suitable cell model for studying hCAR, there was no conclusive evidence that hCAR could mediate induction of CYP2C9 by phenobarbital or other drugs. Rifampicin has been shown to be a potent ligand for hPXR (Moore et al., 2000b). Our present results show that the nuclear receptor PXR mediates the induction of human CYP2C9 by rifampicin, and the effects of hPXR were mediated via the two elements previously described as putative CAR binding sites (Ferguson et al., 2002; Gerbal-Chaloin et al., 2002). Both deletion analyses and mutation of the putative CAR binding sites at –1839 and –2899 demonstrated that these two sites were completely responsible for the induction of CYP2C9 by rifampicin. These data are consistent with the cross-talk reported between CAR and PXR for the PXR-responsive ER6 and DR3 in CYP3A genes and the DR4 motifs in CYP2B (Xie et al., 2000; Sueyoshi and Negishi, 2001). In the present study, the proximal site of CYP2C9 was essential for rifampicin induction, while the distal site appeared to play a cooperative role to produce maximum induction. The data from gel shift assays in this study support our transfection results, showing that both elements bind hPXR, but the proximal element forms a much stronger complex than the distal element. Previously, Gerbal-Chaloin et al. 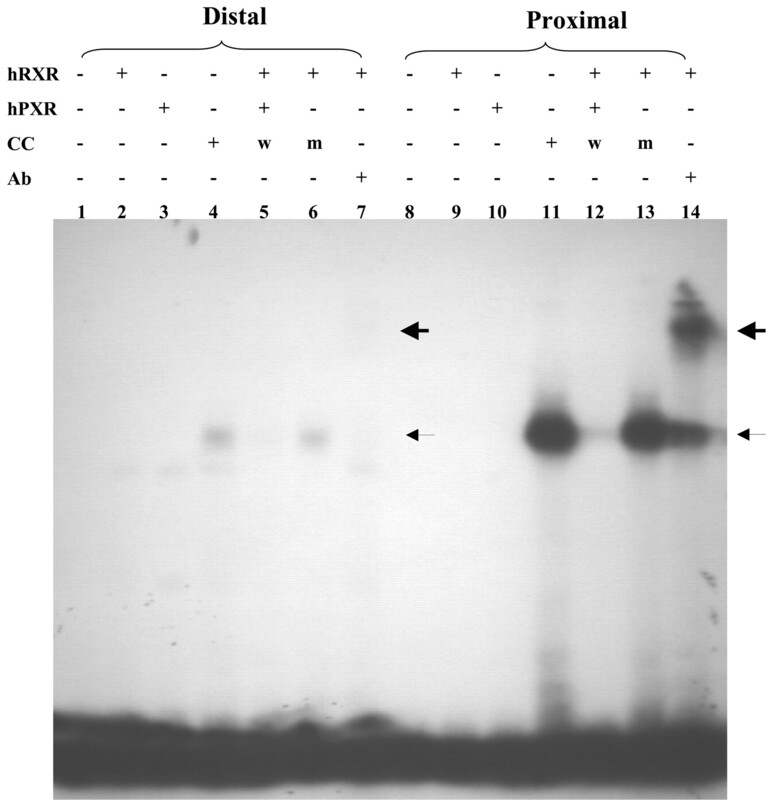 (2002) used an artificial luciferase construct with four copies of the proximal CAR-RE inserted upstream of the SV40 promoter to test whether this CAR-RE mediates rifampicin induction of CYP2C9. This construct was not activated by hPXR in HepG2 cells, but a small 1.6-fold induction by rifampicin was observed in cells cotransfected with PXR. They were unable to observe rifampicin induction of the intact promoter. In our experiments, much stronger hPXR activation and induction by rifampicin were observed within the natural context of CYP2C9 promoter constructs that harbor a single copy of the proximal CAR-RE. This suggests that the context of the element within the promoter is important to evaluate induction by CAR/PXR activators. An example of such an interaction has been reported for a HNF-4 binding site immediately upstream of two PXR/CAR-responsive elements in the distal XREM of CYP3A4 that affects the response to PXR (Tirona et al., 2003). 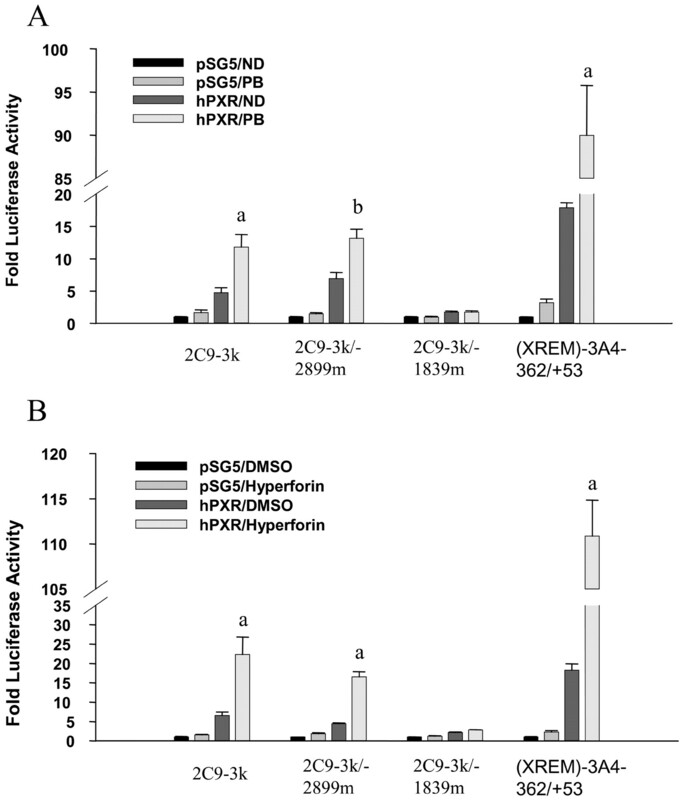 Hyperforin, an active component of the herbal extract St. John's Wort, is a high affinity ligand for PXR (Moore et al., 2000b) and activates the promoters of CYP3A4 and CYP2B6 through activation of PXR and specific PXR cis-elements (Wentworth et al., 2000; Goodwin et al., 2001; Watkins et al., 2003). The PXR-mediated activation of CYP2C9 by 0.2 nM hyperforin is consistent with the high affinity of this compound as a ligand for PXR. Induction studies in human primary hepatocytes demonstrated that phenobarbital induces CYP2C9 (Gerbal-Chaloin et al., 2001; Raucy et al., 2002; Madan et al., 2003), yet the molecular mechanism of induction remained elusive. Previous studies of the induction of CYP2C9 by phenobarbital addressed its known ability to act as a CAR activator (Ferguson et al., 2002; Gerbal-Chaloin et al., 2002). hCAR-mediated induction has been difficult to study due to the inherent nuclear localization of hCAR in cell lines and its high constitutive activity. However, phenobarbital has been reported to up-regulate CYP3A4 via PXR (Luo et al., 2002), and one study suggests it is a weak agonist of PXR (Moore et al., 2000b). Alternatively, one cannot exclude the possibility that phenobarbital acts by recruiting coactivators to PXR. The present study shows that phenobarbital induction of CYP2C9 is mediated by hPXR. Although we cannot rule out a role for hCAR, the magnitude of the PXR-mediated promoter activation by phenobarbital is consistent with magnitude of induction of CYP2C9 protein in human hepatocytes (Gerbal-Chaloin et al., 2001; Rae et al., 2001; Raucy et al., 2002; Madan et al., 2003; Watkins et al., 2003). Recently, distal drug responsive elements have been identified in the promoters of certain P450 genes, such as the XREM localized at –7.8 kb of the CYP3A4 promoter and XREM at –8.5 kb of the CYP2B6 promoter (Goodwin et al., 1999; Wang et al., 2003). These distal elements bind PXR and synergize with the proximal element to achieve full rifampicin induction. To determine whether possible distal regulatory elements within the CYP2C9 promoter play a role in rifampicin induction, we compared induction of a 12-kb CYP2C9 luciferase promoter construct with that of a CYP2C9-3kb promoter construct. The two promoter constructs were induced equally by rifampicin. Moreover, mutation of the proximal CAR-RE abolished the induction with either the 3- and 12-kb CYP2C9 luciferase reporter constructs by rifampicin, suggesting that it is unlikely that additional distal PXR elements play a major role in induction of CYP2C9. In conclusion, inducers of CYP2C9 such as rifampicin, hyperforin, and phenobarbital act via PXR. Rifampicin induction of CYP2C9 appears to be mediated primarily via an essential proximal PXR-responsive element at –1839 from the translation start site of CYP2C9. A second distal CAR/PXR-responsive element at –2899 may play a smaller cooperative role. Comparison of –12- and –3-kb promoter constructs suggests that it is unlikely that more distal sites play major roles in the induction of CYP2C9. We thank Dr. T. Sueyoshi for generous technical expertise and discussion, Dr. Joseph Haseman, Biostatistic Branch, NIEHS for statistical analyses, Sherry Coulter for assistance with software, and Dr. Tracy DeLozier for comments on this manuscript. ABBREVIATIONS: CAR, constitutive androstane receptor; PXR, pregnane X receptor; hRXR, human retinoid X receptor; hCAR, human CAR; hPXR, human PXR; CAR-RE, constitutive androstane receptor-responsive element; DMSO, dimethyl sulfoxide; P450, cytochrome P450; kb, kilobase; bp, base pair. Ferguson SS, LeCluyse EL, Negishi M, and Goldstein JA (2002) Regulation of human CYP2C9 by the constitutive androstane receptor: discovery of a new distal binding site. Mol Pharmacol 62: 737–746. Gerbal-Chaloin S, Daujat M, Pascussi JM, Pichard-Garcia L, Vilarem MJ, and Maurel P (2002) Transcriptional regulation of CYP2C9 gene. Role of glucocorticoid receptor and constitutive androstane receptor. J Biol Chem 277: 209–217. Gerbal-Chaloin S, Pascussi JM, Pichard-Garcia L, Daujat M, Waechter F, Fabre JM, Carrere N, and Maurel P (2001) Induction of CYP2C genes in human hepatocytes in primary culture. Drug Metab Dispos 29: 242–251. Goldstein JA (2001) Clinical relevance of genetic polymorphisms in the human CYP2C subfamily. Br J Clin Pharmacol 52: 349–355. Goldstein JA and de Morais SM (1994) Biochemistry and molecular biology of the human CYP2C subfamily. Pharmacogenetics 4: 285–299. Heimark LD, Gibaldi M, Trager WF, O'Reilly RA, and Goulart DA (1987) The mechanism of the warfarin-rifampin drug interaction in humans. Clin Pharmacol Ther 42: 388–394. Honkakoski P (2003) Drug-activated nuclear receptors CAR and PXR. Ann Med 35: 172–182. Ibeanu GC and Goldstein JA (1995) Transcriptional regulation of human CYP2C genes: functional comparison of CYP2C9 and CYP2C18 promoter regions. Biochemistry 34: 8028–8036. Kawana K, Ikuta T, Kobayashi Y, Gotoh O, Takeda K, and Kawajiri K (2003) Molecular mechanism of nuclear translocation of an orphan nuclear receptor, SXR. Mol Pharmacol 63: 524–531. Kay L, Kampmann JP, Svendsen TL, Vergman B, Hansen JE, Skovsted L, and Kristensen M (1985) Influence of rifampicin and isoniazid on the kinetics of phenytoin. Br J Clin Pharmacol 20: 323–326. Kliewer SA, Moore JT, Wade L, Staudinger JL, Watson MA, Jones SA, McKee DD, Oliver BB, Willson TM, Zetterstrom RH, Perlmann T, and Lehmann JM (1998) An orphan nuclear receptor activated by pregnanes defines a novel steroid signaling pathway. Cell 92: 73–82. Lee CR, Goldstein JA, and Pieper JA (2002) Cytochrome P450 2C9 polymorphisms: a comprehensive review of the in-vitro and human data. Pharmacogenetics 12: 251–263. Luo G, Cunningham M, Kim S, Burn T, Lin J, Sinz M, Hamilton G, Rizzo C, Jolley S, Gilbert D, Downey A, Mudra D, Graham R, Carroll K, Xie J, Madan A, Parkinson A, Christ D, Selling B, LeCluyse E and Gan LS (2002) CYP3A4 induction by drugs: correlation between a pregnane X receptor reporter gene assay and CYP3A4 expression in human hepatocytes. Drug Metab Dispos 30: 795–804. Madan A, Graham RA, Carroll KM, Mudra DR, Burton LA, Krueger LA, Downey AD, Czerwinski M, Forster J, Ribadeneira MD, Gan LS, LeCluyse EL, Zech K, Robertson P Jr, Koch P, Antonian L, Wagner G, Yu L and Parkinson A (2003) Effects of prototypical microsomal enzyme inducers on cytochrome P450 expression in cultured human hepatocytes. Drug Metab Dispos 31: 421–431. Maglich JM, Parks DJ, Moore LB, Collins JL, Goodwin B, Billin AN, Stoltz CA, Kliewer SA, Lambert MH, Willson TM, and Moore JT (2003) Identification of a novel human constitutive androstane receptor (CAR) agonist and its use in the identification of CAR target genes. J Biol Chem 278: 17277–17283. Miners JO and Birkett DJ (1998) Cytochrome P4502C9: an enzyme of major importance in human drug metabolism. Br J Clin Pharmacol 45: 525–538. Moore JT and Kliewer SA (2000) Use of the nuclear receptor PXR to predict drug interactions. Toxicology 153: 1–10. Moore LB, Goodwin B, Jones SA, Wisely GB, Serabjit-Singh CJ, Willson TM, Collins JL, and Kliewer SA (2000a) St. John's wort induces hepatic drug metabolism through activation of the pregnane X receptor. Proc Natl Acad Sci USA 97: 7500–7502. Moore LB, Parks DJ, Jones SA, Bledsoe RK, Consler TG, Stimmel JB, Goodwin B, Liddle C, Blanchard SG, Willson TM, Collins JL, and Kliewer SA (2000b) Orphan nuclear receptors constitutive androstane receptor and pregnane X receptor share xenobiotic and steroid ligands. J Biol Chem 275: 15122–15127. Niemi M, Backman JT, Neuvonen M, Neuvonen PJ, and Kivisto KT (2001) Effects of rifampin on the pharmacokinetics and pharmacodynamics of glyburide and glipizide. Clin Pharmacol Ther 69: 400–406. Rae JM, Johnson MD, Lippman ME, and Flockhart DA (2001) Rifampin is a selective, pleiotropic inducer of drug metabolism genes in human hepatocytes: studies with cDNA and oligonucleotide expression arrays. J Pharmacol Exp Ther 299: 849–857. Raucy JL (2003) Regulation of CYP3A4 expression in human hepatocytes by pharmaceuticals and natural products. Drug Metab Dispos 31: 533–539. Raucy JL, Mueller L, Duan K, Allen SW, Strom S, and Lasker JM (2002) Expression and induction of CYP2C P450 enzymes in primary cultures of human hepatocytes. J Pharmacol Exp Ther 302: 475–482. Sueyoshi T and Negishi M (2001) Phenobarbital response elements of cytochrome P450 genes and nuclear receptors. Annu Rev Pharmacol Toxicol 41: 123–143. Sullivan-Klose TH, Ghanayem BI, Bell DA, Zhang ZY, Kaminsky LS, Shenfield GM, Miners JO, Birkett DJ, and Goldstein JA (1996) The role of the CYP2C9-Leu359 allelic variant in the tolbutamide polymorphism. Pharmacogenetics 6: 341–349. Tirona RG, Lee W, Leake BF, Lan LB, Cline CB, Lamba V, Parviz F, Duncan SA, Inoue Y, Gonzalez FJ, Schuetz EG, and Kim RB (2003) The orphan nuclear receptor HNF4alpha determines PXR- and CAR-mediated xenobiotic induction of CYP3A4. Nat Med 9: 220–224. Watkins RE, Maglich JM, Moore LB, Wisely GB, Noble SM, Davis-Searles PR, Lambert MH, Kliewer SA, and Redinbo MR (2003) 2.1 A crystal structure of human PXR in complex with the St. John's wort compound hyperforin. Biochemistry 42: 1430–1438. Waxman DJ (1999) P450 gene induction by structurally diverse xenochemicals: central role of nuclear receptors CAR, PXR and PPAR. Arch Biochem Biophys 369: 11–23. Wentworth JM, Agostini M, Love J, Schwabe JW, and Chatterjee VK (2000) St John's wort, a herbal antidepressant, activates the steroid X receptor. J Endocrinol 166: R11–R16. Williamson KM, Patterson JH, McQueen RH, Adams KF Jr, and Pieper JA (1998) Effects of erythromycin or rifampin on losartan pharmacokinetics in healthy volunteers. Clin Pharmacol Ther 63: 316–323. Zilly W, Breimer DD, and Richter E (1975) Induction of drug metabolism in man after rifampicin treatment measured by increased hexobarbital and tolbutamide clearance. Eur J Clin Pharmacol 9: 219–227.